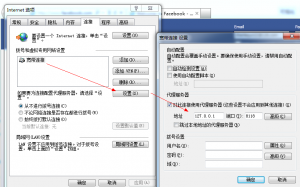 As we know we can’t visit some websites such as Facebook and Youtube in Chinese mainland because of something that we all know. Of course, we can use some software to “Jump across the wall”. 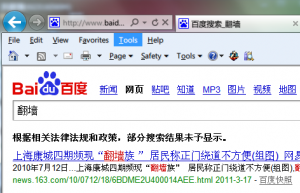 If you’ve ever searched for 翻墙, you may be disappointed because 翻墙 has been hidden in Baidu. 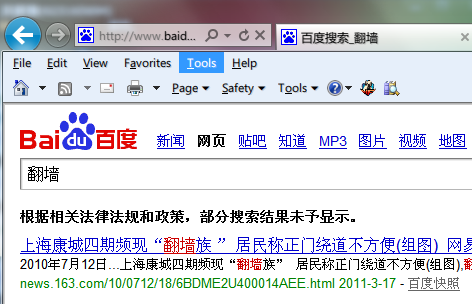 And if you searched 翻墙 in Google, you’ll find that the page cannot be displayed. 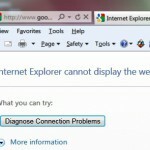 So can’t we visit those wonderful webpages? Yes, we can! With the help of Tor, we can easily connect the outside network which has been forbidden by the GFW. First at all, you should download Tor and then install it. To get it, you can visit:https://www.torproject.org/download/download.html.en. 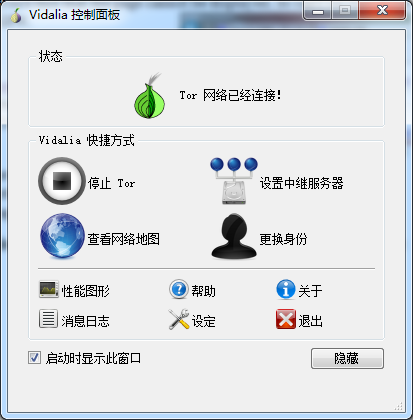 For Windows users, I advise you to download [Stable Vidalia Bundle works with Windows 7, Vista, XP]. 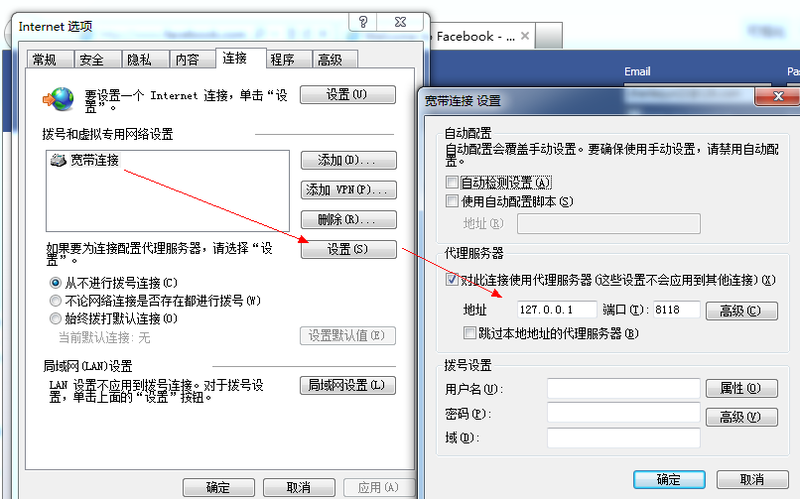 For Linux users, I’ll write it in another article. After finishing downloading it, you need to install Tor. 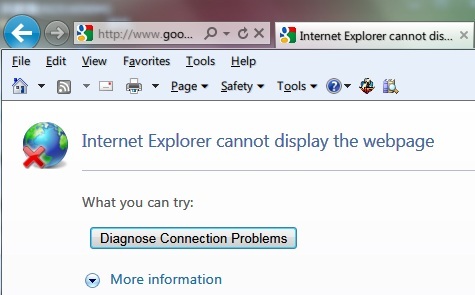 I think it’s not difficult under Windows to install a software. By the way, remember to install Tor+Vidalia+Polipo together. If you like using Firefox, you can install Torbutton(It’s useful). Next, run Vidalia. You’ll find that you can’t connect to Tor Network. Yeah, because you’re in China now. Your ISP blocks connections to Tor Network. So let’s solve the problem. Click on “Setting” in Vidalia Control Panel. Switch to Network tab and select “My ISP blocks connections to the Tor network”. 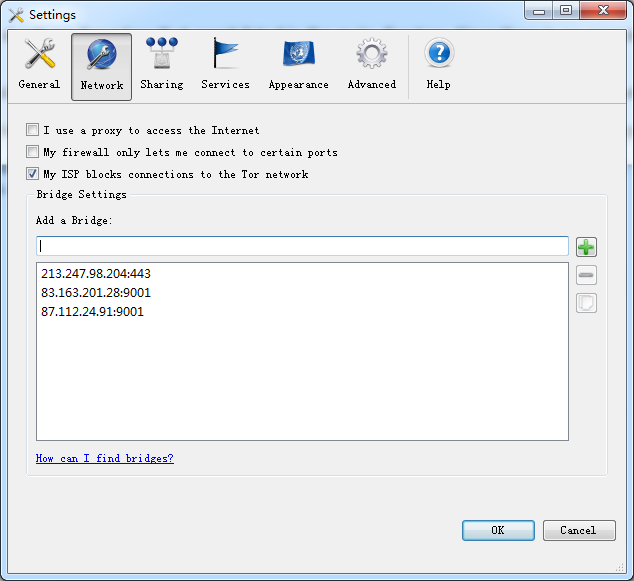 At the same time, visit https://bridges.torproject.org/ to get the bridges. Add them into your Vidalia. Now stop Tor and start Tor again. 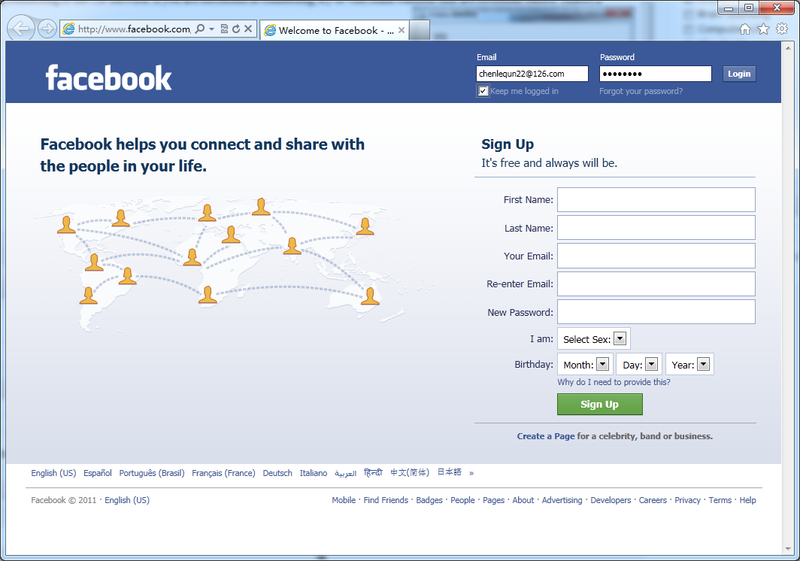 Wait for seconds, you’ll see that you’re online. Now, all the rest is to wait for finishing connecting to the Tor network. 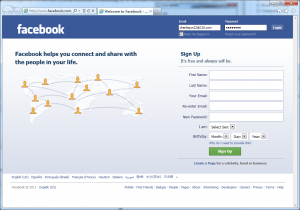 If you are successful in connecting, try to visit some websites that are forbidden before. There’s a suprise!